on her October 31, 1953 telecast. 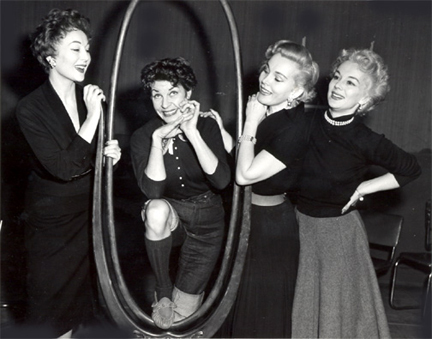 At the end of the 1952-1953 season, it looked as though All Star Revue had finished its run. But when NBC's Saturday night comedy extravaganza Your Shows of Shows decided to switch to a three-out-of-four weeks format, the network needed something to plug into the fourth week. All Star Revue got the nod and found itself back in business. Because Show of Shows was ninety minutes long, an extra half hour had to be tacked onto Revue to fill out the time slot. The plan was to retain the rotating hosts arrangement, with Hoagy Carmichael, Sonja Henie, Ethel Merman, Martha Raye, and Noel Coward mentioned at various times as possible hosts. But when Raye led off the season and scored big in the ratings, NBC decided to keep her coming back. The critics liked her as well, with writer-director Nat Hiken singled out as one of the major factors in the comedienne's success. By the start of 1954, after all but one of the episodes had been hosted by Raye, it was decided to change the name to The Martha Raye Show. This time, All Star Revue was gone for good. Note: In one sketch, Martha asks boyfriend Rocky to arrange a blind date for her friend Margaret, and he comes up with fellow boxer Jake. According to Variety, "The excellence of the show indicated that [Raye's] partnership with director-writer Nat Hiken is one of the most potent comedy liaisons on video." Note: Martha plays Marta, the long-lost "fourth Gabor sister," with Lilia Skala as their mother. Variety called this "a cleverly written and staged farce that missed being sock only because they tried too hard to extend the joke." Note: Eartha sings her hit "Santa Baby." This was the only episode of the fourth season not hosted by Martha Raye. She had taken a turn as host of The Colgate Comedy Hour just thirteen days earlier (November 15th) and guest starred on The Milton Berle Show November 10th, so Phil Harris filled in, giving Martha a much-needed rest. Note: This episode features parodies of the operas Carmen and La Boheme, as well as of Your Hit Parade (the show that immediately followed this one on NBC).